Kansas City, Mo. — Invicta Fighting Championships is returning to California. The promotion will visit The Hangar at the OC Fair & Event Center in Costa Mesa on Saturday, Jan. 16. The event will stream live and exclusively on UFC Fight Pass beginning at 9 p.m. ET. Headlining the event will be featherweight champion Cristiane “Cyborg” Justino (14-1, 1 NC), who will put her belt on the line against Russian newcomer Daria Ibragimova (9-1). Cyborg successfully defended her 145-pound title at Invicta FC 13 in July, stopping New Zealand’s Faith Van Duin in under a minute. Ibragimova will make her promotional debut riding a seven-fight winning streak. Seven of her nine career victories have come via submission and six of her wins have come inside the first round. In the co-main event, the strawweight title will be up for grabs between champion Livia Renata Souza (8-0) and fellow unbeaten DeAnna Bennett (8-0). The Brazilian Souza captured the 115-pound title with a fourth-round finish of Katja Kankaanpää at Invicta FC 12. Seven of the 24-year-old’s wins have come via submission, including five in the first round. Utah’s Bennett has won four straight inside the Invicta cage. Since dropping to 115 pounds, she has topped Norma Rueda Center, as well as the aforementioned Kankaanpää, in her last two outings. Also announced for the event will be another strawweight bout between recently signed UFC veteran Angela Hill (2-2) and veteran striker Jodie Esquibel (5-1). 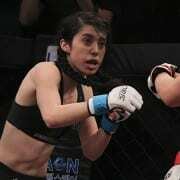 Esquibel will move up from atomweight riding a two-fight winning streak. Additional bouts for the event will be announced in the coming weeks. Tickets for Invicta FC 15 go on sale starting today at 10 a.m. PT and can be purchased at fightcluboc.tix.com.